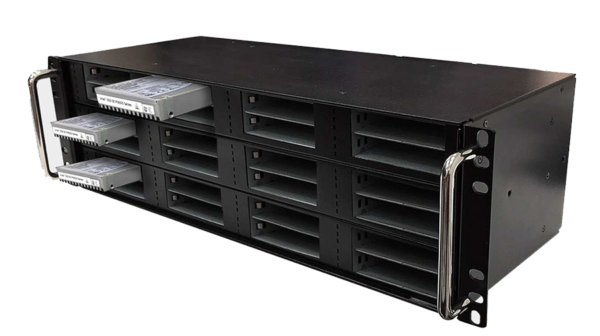 The Serial Cables Multi-protocol (SATA/SAS & PCIe/NVMe) Drive Test system is composed of the base 8, 16 or 24 slot test system configurations and for PCIe/NVMe an additional PCIe switch enclosure is required. 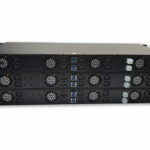 The switch enclosure contains two Microsemi PCIe Gen3 PFX8535 switches. 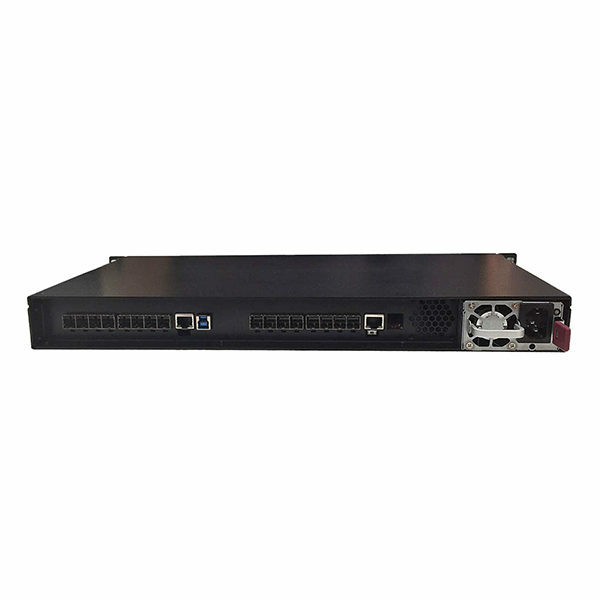 The SwitchTec fanout switch is PCIe Base 3.1 Spec-compliant with an integrated hot and surprise – plug controller on each port. Each of these controllers has less than 170 nanoseconds of bidirectional non-blocking cut-through latency. 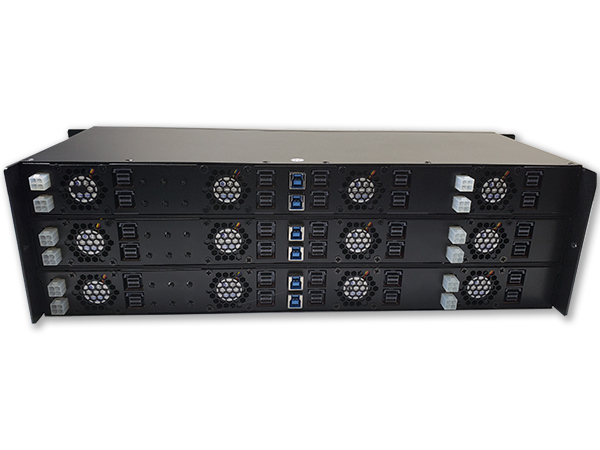 Two x16 input channels per/switch (MiniSAS HD) support PCIe Gen3 x32 256GT/s bandwidth. Each of the PCIe Gen3 x4 slots can be split into 1×4 or 2×2 links for a single port 1×4 or dual port 2×2 PCIe/NVMe drives support. The drive enclosure support can support 8, 16 or 24 drive slots, each implementing red, blue and green LEDs for testing status indication. 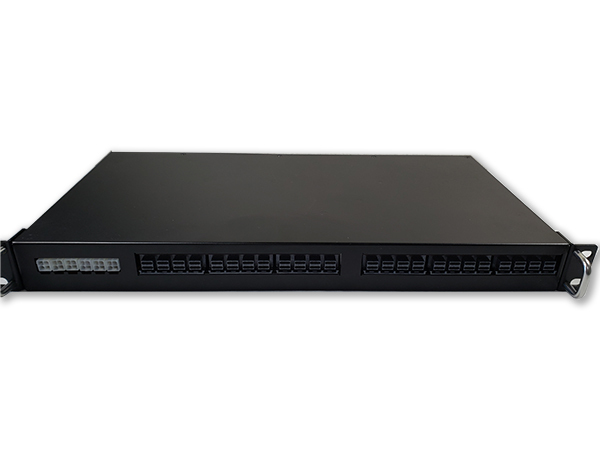 The drive enclosure can be connected to the switch enclosure via internal MiniSAS HD (SFF8643) cables for PCIe/NVMe drive testing or connected to a SAS Host Bus Adapter for SAS/SATA drive testing up to 12Gb/s speeds. Additionally, each power rail on each drive slot can be powered on or off programmatically and voltage/current can be adjusted/read back programmatically as well. Also featured is a tray-less mechanical design with hot-plug support for more convenient drive insertion/removal. **Please note that these devices do not include the required SFF-8643 cables. 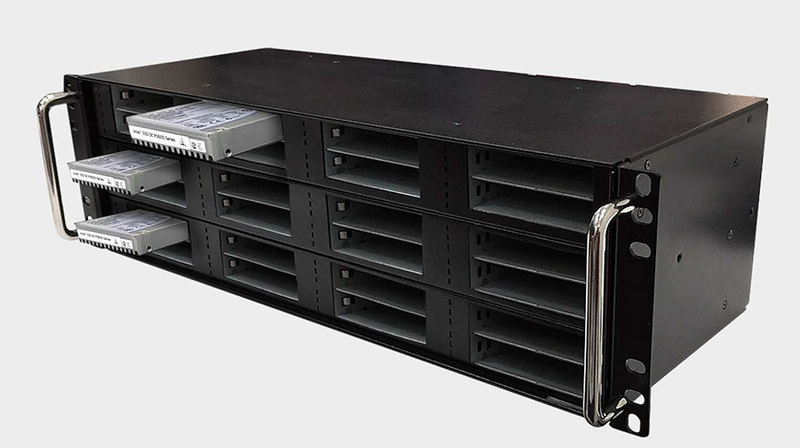 Description: The Serial Cables Multi-protocol (SATA/SAS & PCIe/NVMe) 24-bay Drive Test system is composed of the base 24 slot test system configuration and for PCIe/NVMe an additional PCIe switch enclosure is required.